There is a often repeated story of the consultant that was hired to fix a piece of machinery in a factory. When he arrived, he took a hammer and tapped twice on the machine and it started running. A week later the CEO received an invoice for $1,500. The CEO called to complain and demand a breakdown of the invoice and stated, "All you did was hit the machine with a hammer." The consultant kindly responded that the cost for hitting the machine was only $1, the remainder of the invoice was for knowing where to hit. Though an interesting story, and many consultants use it as a defense for justifying their charges, what the story lacks is commitment from the consultant. You see, he uncovered the problem and provided a solution... for now. If you've retained a consultant and he or she is not committed to your business, the best you can do for your business is to fire them and do so today. Fixing a problem without commitment is what a plumber does. Nothing wrong with this approach, at least for the plumber. But when you hire a consultant, you want to at least know that they have your long-term interest at heart. 1.) Feel the Pain- A business consultant should understand and empathize with your situation. He or she should feel what you are feeling in order to seek and provide a solution. When you explain your issues, they should feel the hurt and frustration that you do. When you are angry they should be just as ticked. When you cry, they should taste salt. They should step inside and become owner, leader, or manager in your organization and wear your shoes. 2.) 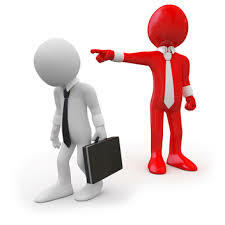 Take ownership of the problem- The consultant that you hire should own whatever the problem is. It should be as if the problems were transferred to the consultant and completely off the plate of the business leader. The consultant should convey sufficient confidence and competence to the business leader that the leader hands over the issue to him or her. The consultant needs to take the issue home, sleep with it, eat with it, bath it, and own it. 3.) Follow-Up - This is typically an area where most consultants fail. They tackled the problem, washed their hands, and forgot about it. The client is left feeling alone again hoping that the issue was completely resolved and that someone will follow-up to make sure. Tragically, the business leader uncovers another issue, but is unsure whether the consultant cares enough to fix another problem and so delays contacting him. Your business is too precious to allow an outsider with no blood in the game to come in and tinker with. If your consultant doesn't feel your pain, own the problem and then follow-up with you long after the invoice is paid---fire them. Though rare, you can find those who will possess these three qualities and walk with you through the trenches providing solutions along the way.